grandma's cookie jar: Four Special Books Give-Away & Resurrection Sunday Fun for Everyone! Four Special Books Give-Away & Resurrection Sunday Fun for Everyone! I was recently invited to participate in a special give-away where one of you will win four books from Zonderkidz! Yes, four books! The books arrived for me to review yesterday, but I have to have the winner's information to Zonderkidz in one week, so this will be a short give-away. These books will make great additions to the baskets you give to your grandchildren, children or just as a special surprise! 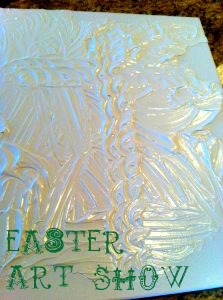 I love celebrating Resurrection Sunday, so along with this give-away, I'll include a couple fun crafts which you could include in your baskets - or use with your grandchildren, children or a Sunday School class. Let's begin with the books you will receive if you are the winner! Sturdy board book - great for little ones! Zonderkidz says; "The Beginner's Bible Stories About Jesus follows the story of Jesus’ life from His humble birth to His life as an adult as He preaches and teaches the people. Using the classic iconic art and simple text from The Beginner’s Bible, this padded board book will appeal to the youngest reader with its message of God’s love and its stories of the miracles and words of Jesus." I think The Beginner's Bible Stories About Jesus is a book little ones will enjoy and a wonderful tool to help introduce our youngest grandchildren/children to Jesus, Who He is and what He did! I love all the color in the illustrations! I LOVE Dennis Jones' illustrations - he is one of my favorite illustrators - I'm very happy to see he illustrated this book! Walks children through Jesus' life with a focus on how much He loves us, why He came and what He did for us! Great challenge to children to go and keep telling others about Jesus until He returns! Zonderkidz says; "A simple retelling of the Easter story, this small and affordable format paperback, The First Easter Ever is sure to be popular with young readers. Using the vibrant and popular artwork of Dennis Jones, families can share this timeless story of God’s promise of everlasting love each Easter season." This little book is filled with colorful, engaging and fun illustrations which capture the joy of Jesus and of those who knew He loved them! The First Easter Ever is a perfect book to use with young children on Resurrection Sunday morning to focus on what we are celebrating and why we are celebrating! Shares stories of real people and how they experienced God's grace in their lives. Using these real people and real stories, this book shows how God's grace is for everyone; no matter what we have done. Each chapter ends with two questions in the "Face-to-Face with Grace" section which helps focus children from the story about a real person to how God's grace looks in their own lives. Zonderkidz says; "What does “grace” really mean? How can God’s grace impact your life? How can you experience grace every day? This new book by New York Times bestselling author, Lee Strobel, shows how God’s love is for everyone—no matter what. Through stories of everyday people whose lives have been changed, you will discover God’s love and the power of forgiveness. You will experience God’s amazing grace and be able to share it with others." I love how Case for Grace for Kids shares real stories of real people and how they experienced God's grace and then connects it to the child reading the book. This could make a great book for families to read through together before or after Resurrection Sunday as it is sure to generate some great conversations about God's amazing grace! Zonderkidz says; "NIV Gift Bible for Kids is the perfect gift for graduations, confirmations, and other special achievements." I think NIV Gift Bible for Kids is a great bible to give children who want to carry a real Bible to church, but are not ready for an actual study-bible. It is also perfect to use as a gift Bible for children in a Sunday school class, or just to have on hand in case your grandchild or child has a friend who would like a Bible. Okay, so these are the four books in this fun give-away! One of you will win all four, but everyone can enjoy the following Resurrection Sunday fun with your grandchildren, children or Sunday school class which will help us all keep our focus on celebrating what Resurrection Sunday is really all about! Let's begin with the Resurrection Sunday M&M project I found on Pinterest! All you need are M&M's and a free printable about how M&M's help us remember what Jesus did on Resurrection Sunday - which you will find at this link. You could make these and put them in your grandchildren's, children's baskets or give to your Sunday school class, or have the children assemble their own - and make one to give away! And, for the specifics on how to enter the give-away . . . I'm very happy to say, not only did Zonderkidz send me one copy of each of the books in this special package for me to review, but they are making another set of them available for me to give away - USA only. If you are over the age of 18 and would like to be in the drawing for this special gift pack, which will be on March 22, 2015, please comment below to let me know what your family does to celebrate Resurrection Sunday - we decorate eggs, have an egg hunt, go through the Resurrection Eggs together and have dinner as a family! In addition, you will receive additional entries if you have followed on Google+, Google Friend Connect, followed by liking on facebook with the tab at this link (not just liking the post) and/or have followed grandma's cookie jar by email. For each of these which you have done you will receive one entry. In addition, if you "share" this post, you'll receive an additional entry (please let me know if you share). This will help me be able to draw names from among people who would like to win this gift package and it gives you several ways to enter the give-away! Since this is a short give-away, if you enter, PLEASE be sure to check back on March 22, 2015 to see if you win (you will only have one day to get your info to me so the prize can be sent to you if you win). Special Good Friday services start the weekend. Decorating eggs, egg hunts, and dinner after church on Easter Sunday. Also sunrise service at a local farm is a special part of celebrating together. My family comes to my house for Easter and we have an egg hunt. Of course, this is after we have worshiped together. I have used the m&m lesson often in Sunday School. These books sound wonderful. I follow on facebook and email. My family comes to search for eggs, eat a fun lunch and have a time sharing the story of Jesus before we eat. I am also sharing on Facebook. Church and family dinner. We also do an egg hunt. We go to church and have a family dinner!